Acer Aspire M3400: How Much Does $649 Buy? Reviewing the Dell Studio XPS 7100 recently was very interesting and even enlightening. Our audience may chiefly be people who build their own machines (and indeed we certainly review enough hardware), but it was refreshing to see the oft-maligned "factory build" put in a good showing and justify its existence in our world of enthusiasts and builders. If you didn't feel like putting together your own machine for high-performance gaming and computing and didn't want to pay through the nose for a custom enthusiast build, the XPS 7100 was a fine choice. But we're not talking about a twelve-hundred-dollar mean machine here. We're talking about a $649 budget build, and in this author's opinion those waters are substantially more fraught than the consumer market for machines north of a large. A reliable budget build is the kind of thing a good enthusiast can specialize in, so the question for Acer becomes...is the M3400 worth the trade-offs? We lose name brand components and the individual warranties that go along with them, but we gain something that's been built and tested from the factory and at least guaranteed to work as is, and we potentially gain more computer than we could've gotten for the price had we built it ourselves. 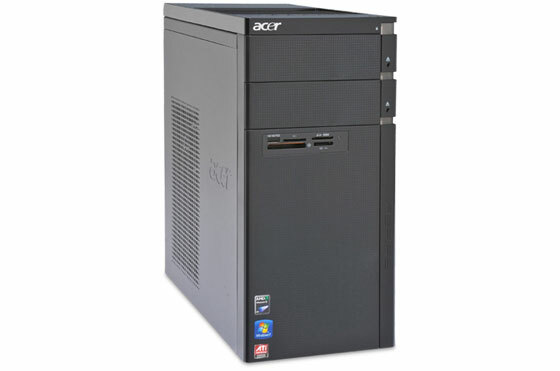 The Acer Aspire M3400-U2052 (gotta love those catchy Acer names) is the top end of the M3400 line. Starting at the top, we have the heretofore-thought-to-be-defunct AMD Phenom II X4 820; the 800 series Phenom IIs had a very brief tenure in the marketplace but apparently live on in OEM circles. The only difference between an 800 and 900 series Phenom II X4 is in the amount of L3 cache: the 820 sports only 4MB while the 900s have the full 6MB. Given the middling performance differences in most circumstances between the entirely cacheless Athlon II X4 and the Phenom II X4, the lost 2MB of L3 probably isn't worth losing any sleep over. At 2.8 GHz, the 820 should provide plenty of performance for the price. There are two extremely pleasant surprises in the Aspire M3400's build. The first is the use of the modern AMD 800 series chipset, which brings 6Gbps SATA support along with generally improved storage performance. If nothing else, the motherboard has legs that it may very well be able to stretch as prices on SSDs continue to fall while performance continues to rise. The other is the inclusion of a Western Digital Caviar Blue 640GB drive. These drives have been excellent and reliable performers since their introduction years ago and have remained near the top of the performance heap for mechanical hard drives; I might just be biased, though, I've been running four in my own tower for years and have been consistently pleased with their performance along with their low acoustics and power consumption. Everything else in the Aspire M3400 seems bog standard, but there is an odd bird in this configuration: the Radeon HD 5450. In Ryan's review of it he wasn't particularly impressed and it's not hard to see why: the 5450 offers virtually no practical improvement on its predecessors. The inclusion here is even more questionable, because while a Radeon HD 5450 on the shelf can at least be justified as a potential HD playback performance upgrade, the M3400's motherboard has capped HDMI and VGA ports that suggest an 880G integrated graphics part on board. The 880G already has enough horsepower to handle decoding HD, and the 5450 isn't going to bring enough of an improvement in image quality or gaming performance to justify its inclusion. Okay, it's roughly twice as fast as the integrated HD 4290 and it has DX11 support, but it's a $40 entry-level GPU when $65 gets four times as many Stream Processors in the HD 5550. All things being equal, we'd rather have gone up to the full 8GB of DDR3 or the HD 5550 rather than get the 5450. The M3400 is rounded out by a DVD+/-RW combo drive, standard media reader, and gigabit ethernet. We'd have liked to see some kind of wireless networking solution included, or a Blu-ray reader (which may have driven costs up, but they're so cheap these days anyhow), but these omissions aren't deal-breakers. As a whole, this review unit seems reasonable for the asking price, but let's take a closer look. Shipping to a California zipcode added ~$30, so you're looking at either $610 or $650. So what you're saying the system should be 600 $ if you factor in the shipping. Did you include an OS in your total?